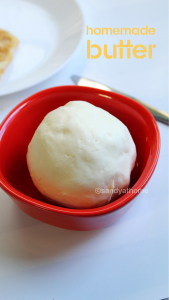 Homemade butter or makhan is such a easy to make at home recipe as it involves just 2 ingredients and just 4 minutes. 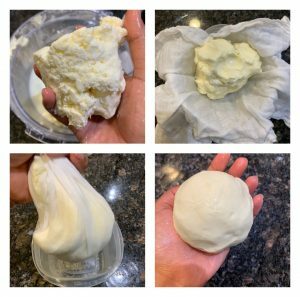 Homemade butter is not only easy to make but fun too and you can make ghee out of it or use it in regular cooking or baking which surely adds extra taste. 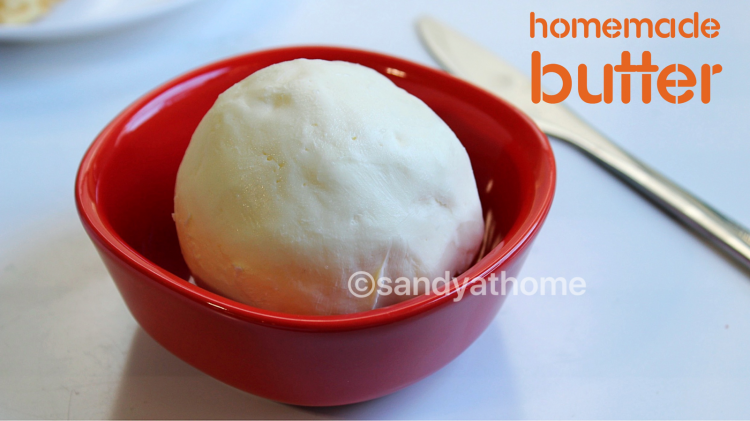 Homemade butter tastes 100 times better than the store bought ones as it is made freshly and most importantly with no preservatives. In olden days making butter was super tough job and I have seen my grandma take all those pains to serve us super yummy ghee made from homemade butter. Does it sound good? Then get a pint of whipping cream and ice cold water voila your butter will be ready in no time. Actually i had no plans of posting butter making recipe in blog never, but happened to get it for making some other recipe for which very little cream was only used so made use of that remaining cream in best possible easy way. 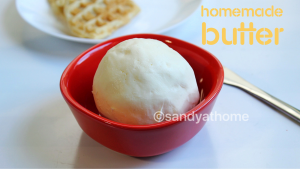 If you plan to make butter at home make sure to get heavy whipping cream because the more fat more creamy butter. For this recipe you need a blender, I don’t know if it works in a mixie as I have not tried making butter with it. You can make just unsalted butter which can be used for for making ghee as well or add salt or flavors too. So lets get to the making! 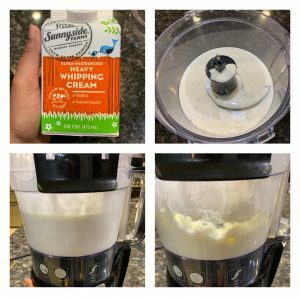 In a blender add heavy whipping cream. Blend it for straight 4 minutes. 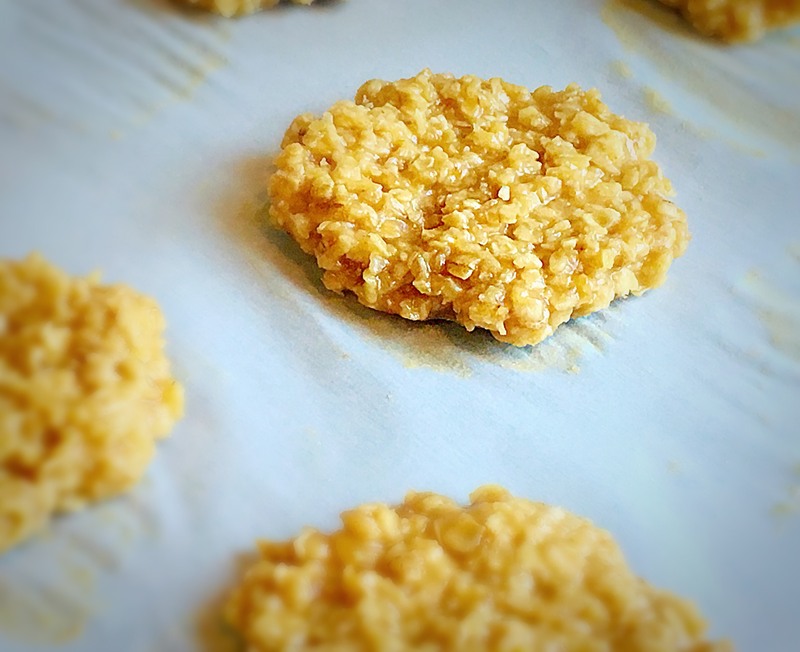 Initially you will see the mixture form cream or peaks consistency later you can see it form crumbles. 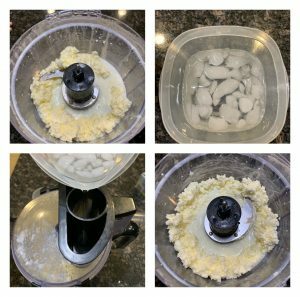 After 4 minutes open the blender and you will find light yellow crumbles which is the butter and the water is is buttermilk. Now add ice cold water and blend it again for 1 minute. This step is very important as we want the butter to completely separate from the buttermilk. Now butter is almost ready. After 1 minute of blending remove the butter with you hands and drain the water. You can add all the butter crumbles in muslin cloth and drain the water. After all the water is removed the butter is ready for use. Store the butter in fridge. I dint add any flavors to the butter as I will make with it. You can add salt or other flavors too. After 4 minutes open the blender and you will find light yellow crumbles which is the butter and the water in it is buttermilk. Now add ice cold water (not the ice) and blend it again for 1 minute. This step is very important as we want the butter to completely separate from the buttermilk. Now butter is almost ready. After 1 minute of blending remove the butter with you hands and drain the water. You can add all the butter crumbles in muslin cloth/ strainer and drain the water. If you don’t have both just try to squeeze the water using your hands. After all the water is removed the butter is now ready for use. Store the butter in fridge. I did not add any flavors to the butter. You can add salt or other flavors too.